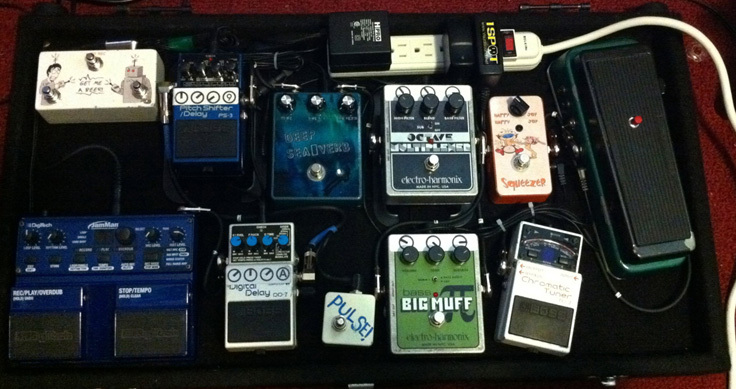 Today’s pedal line is from Matt Streit. If you have a pedal line (doesn’t have to be in a board) for your rig, please email me a photo, bio, description of pedals and routing to pedalline@nulleffectsbay.com. Every Friday I’ll showcase a pedal line submission. Make sure you include any links to your band or music page. My name is Matt Streit, I am 29 years old, graphic designer/musician/effects pedal builder-designer-enthusiast. I sing and play bass in a sludge metal band called Burrows www.facebook.com/burrowsct http://burrowsmusic.bandcamp.com/ and I have an acoustic/solo project called the Forest Room www.youtube.com/theforestroom. 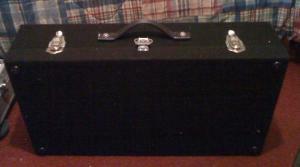 I built this pedalboard myself, along with a few of the pedals on it. Boss TU-2 tuner – I use a daisy chain from this to power the other pedals, except for the Jamman and the DD-7. Dunlop Crybaby Bass wah wah pedal (heavily modded gcb95 – “Bass Wah of Doom”) – a co-worker gave me this bass wah after cleaning his studio, must’ve been sitting for years, it was dirty, had spider nests in it, probably didnt’ work, so I cleaned it up, re-painted it, and did a bunch of mods to it. I did this Foot-on-Switch/true bypass mod to it that I found on instructables.com, a pretty useful switching option I must say; there’s normal crybaby switching and then with a flip of a switch I can have the effect in use only when my foot is on that little red momentary switch on the foot pedal. I also did a Q control mod, bass switch mod, and volume swell mod to it from Griffin Effects. I don’t use wah with the music I play really, but the volume swell is something I use and the wah does go well with creating weird and varying soundscapes combined with my other effects pedals. This sat for a year after I painted it and before assembling it and for some reason the paint didn’t take too well so it’s got some chipping now, I might touch it up or I might keep it. The “beat up” look doesn’t look bad. GGG Dan Armstrong Orange Squeezer Compressor/”Happy Happy Joy Joy Squeezer” – This was from a kit from General Guitar Gadgets. One of my early pedal builds. I designed the artwork, painted it, applied the artwork, and assembled it. It’s a nice simple pedal and does what I want it for. I really only use it for a more consistent volume/tone when doing two-hand tapping stuff. EHX Bass Big Muff – Excellent distortion pedal for bass and I’ve tried a good handful before settling on this. I usually use the “dry mode” and because of that, I am able to mix it well live when with other distortion pedals I’ve used in the past have either been too much or not enough. EHX Octave Multiplexer – Excellent Octave pedal. Great Tracking. Get some great synthesizer-type sounds combined with my distortion. BYOC Reverb/”Deep Sea Verb” – I’ve tried several reverb pedals, kind of a long story how/why I got to this one, but I did a freelance paint/design/graphic application/re-housing to a pedal for a guy in Maryland who had seen my builds on some of the gear messageboards I check out and post on. He bought me the kit in exchange for my services and I must say I’m very happy with this reverb pedal. I did a couple mods to the circuitboard that I found on the BYOC messageboard and through contacting them about it, basically put two trimpots in spots so I could mix the wet and dry to perfection. My favorite pedal art on my board. I did a mixed paint job, green base, with some blue misted over it. I’m really into the Planet Earth BBC documentaries and I took a screen shot from the Caverns episode that I liked and added a diver to it and used a blue led light to make it look like the diver’s flashlight. I think it’s pretty cool when the led light is a part of the artwork. Looks and sounds awesome. Boss PS-3 Pitch Shifter/Delay – This pedal is kind of a secret weapon haha. I get some very unique sounds from it. I use two different settings in a couple subtle small parts, but you can play with this thing for days and get all sorts of weird stuff. Boss DD-7 Digital Delay w/ tap tempo – Excellent and functional delay pedal. I usually just keep it in the analog setting. I first got into looping parts with this pedal cuz it has the loop function which is awesome and easy to use. I built the tap tempo pedal that’s with it which is very useful to have. The tap tempo made a popping noise when I used the daisy chain to power this, so I got a separate adapter for it which solved the problem. Digitech Jamman Looper/Sampler w/ footswitch – I wanted to be able to add more and do more with live looping that the DD-7 can’t do, so I bought this from a guy on craigslist and got a great deal. I use live looping more with the Forest Room project I do, but this is also a very useful tool for writing. I also sometimes load drum beats and/or synthesizer parts that I create in Reason to this pedal. I haven’t used it much with my current band, but i’m sure it’ll get more use in the future. For a trio situation, it is nice to be able to layer parts and sounds to fill up space if needed. I do a lot of multi-tasking haha. I built the footswitch that goes with it which allows me to go up and down the sound banks of the pedal as well as switching between the auto record function. Everything is pretty tight in my pedalboard, but I love it and I don’t really have any need for any more pedals any time soon. I primarily play two Ibanez SR1205 five string neck-thru basses (my main bass is natural color with an aguilar obp-3 onboard preamp and my back-up is the same bass stock electronics and is transparent black). 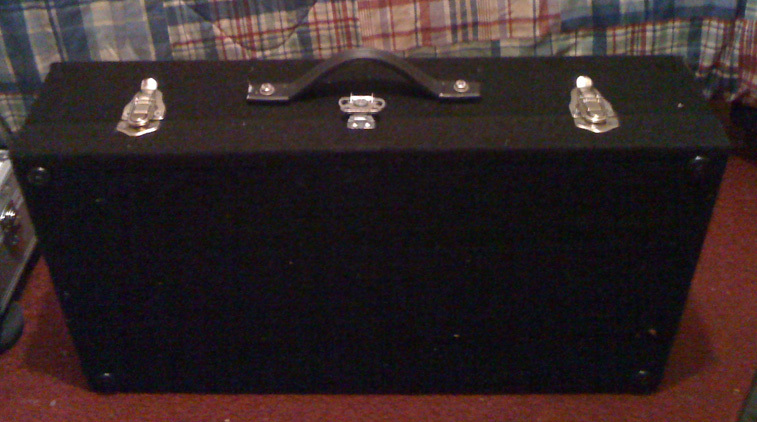 My amp is a Gallien-Krueger 1001RB head with an Ampeg 6×10 cabinet that I put a steel grill over the mesh cover and I put black speaker carpet on the entire cab for better protection. For the Forest Room, I play a 1985 limited edition Ovation Celebrity acoustic guitar and an Ibanez AEB30 acoustic bass guitar that I converted to fretless, coated the neck, and put flatwounds on, and plug that into a small 1×10 peavey bass combo amp. Steely Dan's Jon Herington Pedal BoardPerfect Square Hyperslicer Give Away - Reminder!